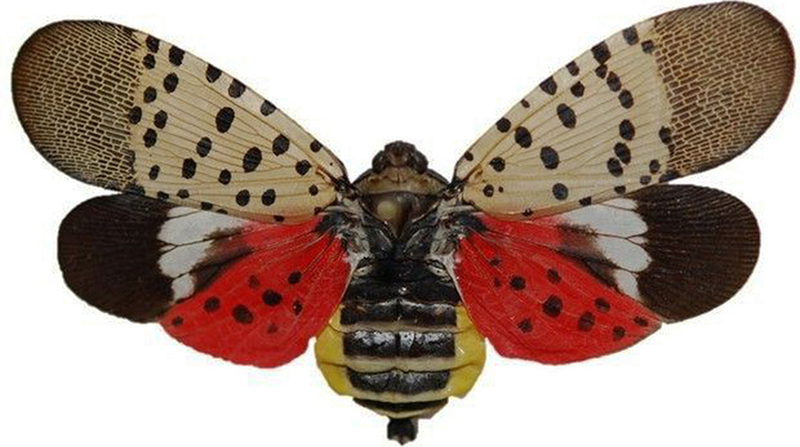 A troublesome tiny Asian visitor known as the spotted lanternfly is hopping from fruit trees onto trucks and railcars throughout the southeastern corner of Pennsylvania, threatening to ruin billions of dollars of agricultural commodities in the state and elsewhere. It’s a hitchhiking bug that doesn’t bite, doesn’t sting, but can quickly destroy grapes, trees, nursery stock and apples, to name just a few of its victims. Agricultural experts believe the invasive insect came to the United States after hopping on a boat from China. It was first spotted in Pennsylvania’s Berks County in 2014. Since then, it has spread like wildfire, spotted in large numbers in 13 Pennsylvania counties now under quarantine, and has been seen in the southern part of New Jersey, Virginia and Delaware — and officials fear the pest could even make its way to vineyards in New York state. “It’s not a strong flier. It’s a hitchhiker,” said Dana Rhodes, the Pennsylvania Department of Agriculture’s chief plant regulatory official. The insect has particularly been a headache for trucking companies hauling an array of agricultural products ranging from grapes to hardwoods, according to Chris Salisbury, transportation manager at Rheems, Pa.-based Wenger Feeds, a company with 75 trucks that haul mostly animal feeds and hardwoods. Truck drivers doing business in affected areas are warned that if they park below a tree line, the vibrant-colored insect can hop onto their truck, hide in a tiny crevice or atop a flatbed and do extensive damage to a valuable load of agricultural commodities. The only way to stop the lanternfly is to use a pesticide, stomp on it with your boot or smash it with a fly swatter, Rhodes said. “It threatens, we believe, $18 billion worth of Pennsylvania agriculture products,” said Shannon Powers, a spokeswoman for the state’s Department of Agriculture. As a result, the U.S. Department of Agriculture has awarded the state $17.5 million to help eradicate the pest, according to Powers. She added, “It secretes a substance called honeydew that then makes the plants susceptible to mold. It destroys them, makes blenders grapes in particular unusable and inedible. Already, state police and agricultural inspectors are on watch, randomly pulling over trucks — not for speeding, but to inspect for lanternflies. Inspectors have been known to turn trucks around and, beginning in May, truckers could be fined for not carrying an inspector’s permit or not having been trained by their company managers to spot and rid their trucks of the tiny critter, Pennsylvania Motor Truck Association spokesman Brandon Moree said. Although the lanternfly has been wreaking havoc with agricultural businesses for some time, the invasive insect remains a bit of a mystery, according to Heather Leach, an extension associate in Penn State University’s entomology department. The infestation can present an even greater challenge to independent owner-operators who carry loads from all over the United States to Pennsylvania who might not have any knowledge of the insect or the requirements to get an inspection permit, Salisbury said.